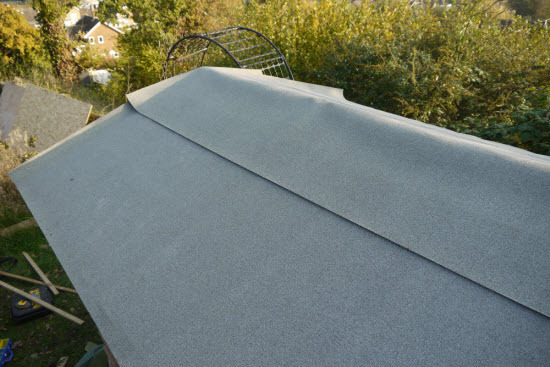 Should You Use Shed Roof Felt to Repair Your Shed Roof? Bituminous shed roof felt is sometimes called tar paper. It is widely used in the UK as a roofing material for garden sheds. It is mainly used because it is the cheapest material in up-front cost but also because it is the only material that most people know as a shed roofing material. Lets have a closer look at this material, how it is used, its shortcomings and also a few of the alternatives that may replace it in the years to come. Over the years various improvements have been made to the manufacturing process so that different weights are available (a standard and heavy duty version). Also rather than just the basic impregnated cloth a type of felt that uses polyester fibres is now available that gives an improved tear resistance over the original product. Shed roofing felt is typically supplied in rolls 1.2m wide and in varying lengths up to about 10m. 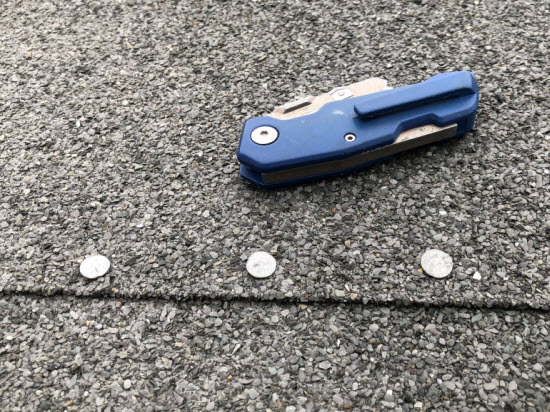 How is shed roof felt installed? 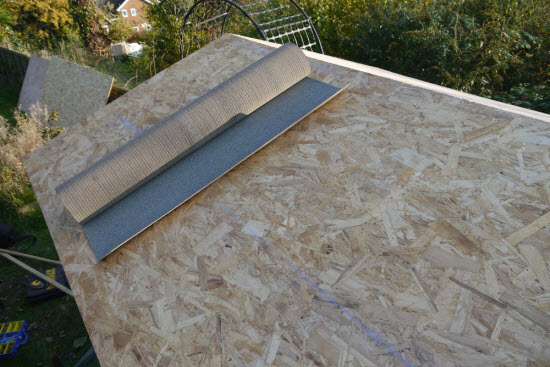 Shed roof felt is installed by nailing it down to a timber roof deck using 'clout' nails. 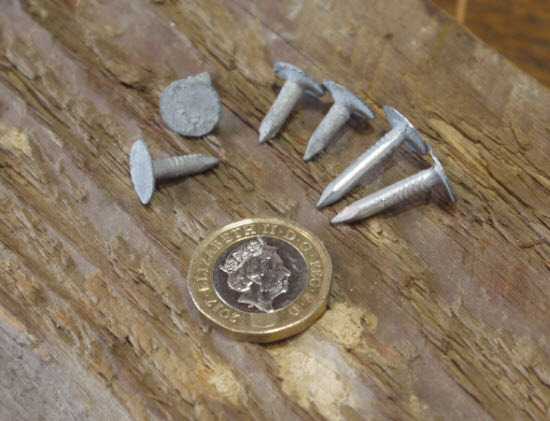 These nails have a large diameter head which is used to stop the felt tearing through. The felt is laid horizontally in strips. The strips are overlapped by 150mm and a black adhesive used to seal the joint. The intention is that the sealant and overlap work together to stop water penetration. A minimum roof pitch of 20 degrees is usually recommended to ensure that the laps remain watertight. One thing that is quite clear from the marketing of roof felt, is the expected life of the product. Typical basic shed roof felt has a life expectancy of 5 years. The heavy duty version 10 years and the Super polyester fibre reinforced version 15 years. With each step up the price of the material increases accordingly. It is worth understanding what happens to shed felt as it ages. The environment on a roof is harsh, it is directly exposed to UV rays, heat, cold, alternate wetting and drying from rain, abrasion from snow and wind blown debris. Life is tough on a roof. As bitumen ages the more volatile parts of the product that originally kept is supple (like skin!) evaporate and it becomes brittle. Eventually cracks appear and water can locally penetrate into the shed roof structure. The cracks in this 8 year old roof have enlarged such that the felt has torn. Water initially penetrates in areas of stress concentration. Such as nail holes or where the felt has been folded at edges and corners. Damage to felt at corner of roof means roof timber is permanently damp, initiating timber decay. You might not notice this initial damage and failure until it is too late. Usually a couple of years after the initial leakage occurred. You might see that the timber structure beneath has been soaked in water and started to rot. If you are lucky no structural damage will have occurred. If you are not so lucky then local repair might be needed. Occasionally contents can be damaged and the shed needs to be replaced. When you buy a shed how long do you expect it to last? I suppose expectations vary but I would think the low end of expectations might be 10-15 years. In my view a shed could last 30 yrs + with reasonable maintenance. With a felt roof this maintenance could involve a minimum of 2 complete replacements of roofing felt. Along with each of these replacements comes the risk of water damage to the contents and/or structural damage to the shed. Unless of course you are very diligent in replacing the felt or watchful for water leakage. The failure on this roof is a combination of cracking and wind damage to the ridge piece. It just seems to me that other roof covering products are available that have a longer expected life than the shed itself. These roof covering products don't cost a significant premium to some versions of shed felt. In fact the table below shows that the cost per year of some roofing products is much lower than shed felt. This doesn't include the additional labour required for replacing the shed felt or any damage that occurs to the shed from leaking roof felt.